Onchocerciasis is an infection caused by the parasitic worm Onchocerca volvulus, spread by the bite of an infected Simulium blackfly. It is also called River Blindness because the fly that transmits infection breeds in rapidly flowing streams and the infection can cause blindness. Persons with heavy infections will usually have one or more of three conditions: skin rash (usually itchy), eye disease, or nodules under the skin. The World Health Organization’s (WHO) expert committee on onchocerciasis estimates that at least 25 million people are infected and 123 million people live in areas that put them at risk of infection. About 300,000 people are blind because of the parasite and another 800,000 have visual impairment. Nearly 99% of infected persons live in Africa; the remainder lives in Yemen and six countries in the Americas. Onchocerciasis is commonly treated with an oral medicine called ivermectin. In what parts of the world am I more likely to get onchocerciasis? Onchocerciasis is locally transmitted in 30 countries of Africa and in Yemen in the Middle East. Local transmission occurred in 13 focal areas in 6 countries in the Americas (Mexico, Guatemala, Ecuador, Colombia, Venezuela, and Brazil), but transmission has now stopped in 11 of these focal areas. Transmission continues in one focal area in Venezuela and one in Brazil. Onchocerciasis in casual travelers is rare; the infection is transmitted in remote rural areas and, unlike malaria, contracting onchocerciasis often requires more than one infectious bite. Thus, risk of infection is greater in adventure travelers, missionaries, and Peace Corps and other long-term volunteers who are likely to have more intense or sustained exposure to blackfly bites. Given the low rate of transmission in the Americas, the likelihood is very low that any travelers in this region (even missionaries and long-term volunteers) would ever get infected. The disease spreads by the bite of an infectious blackfly. 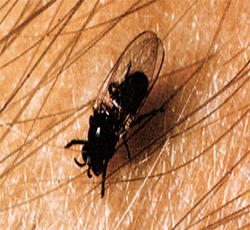 When a blackfly bites a person who has onchocerciasis, microscopic worm larvae (called microfilariae) in the infected person’s skin enter and infect the blackfly. The larvae develop over 2 weeks in the fly to a stage that is infectious to humans. An infectious blackfly will typically drop larvae when biting a person. The larvae then penetrate the skin to infect the person. Because the worms reproduce only in humans but need to complete some of their development inside the blackfly, the intensity of human infection (number of worms in an individual) is related to the number of infectious bites sustained by an individual. Blindness is usually seen in the setting of longstanding and intense infection. Who is most at risk for onchocerciasis? Those most at risk are people who live in areas where the parasite is spread followed by adventure travelers, missionaries, and Peace Corps volunteers who are exposed for long periods of time (generally more than 3 months) to blackfly bites in areas where the parasite exists. The disease is most intensely transmitted in remote rural African agricultural villages which are located near rapidly flowing streams. What is the impact of onchocerciasis? Onchocerciasis is the second leading infectious cause of blindness and can cause debilitating and disfiguring skin disease. However, the worldwide burden of onchocerciasis has been considerably reduced as the result of very successful disease control programs led by the World Health Organization (WHO). These programs are based on control of the blackfly population and/or mass administration to affected communities of an oral drug called ivermectin (Mectizan™), that is donated by Merck & Co., Inc. As a result of these programs, millions of people are at greatly reduced risk of debilitating itching, disfigurement, and blindness caused by onchocerciasis. Unfortunately, many people still do not have access to prevention and treatment measures. What are the clinical manifestations of onchocerciasis? Infected persons may be without symptoms. Those with symptoms will usually have one or more of the three manifestations: skin rash (usually itchy), eye disease, and nodules under the skin. The most serious manifestation consists of lesions in the eye that can lead to visual impairment and blindness. How soon after infection will I have symptoms of onchocerciasis? It can take up to one year for the larvae (also called microfilariae) to develop into an adult inside the human body and between 10 and 20 months before larvae can be found in the skin. Each adult female worm, which can live from 10–15 years, can produce millions of new larvae during her lifetime. As it is the larvae that cause most of the symptoms of onchocerciasis, most people feel well until after the adults start producing large numbers of new larvae. What should I do if I think I may have onchocerciasis? If you think you might have onchocerciasis, see your health care provider who may order skin biopsies (“snips”) or blood tests looking for antibodies to the parasite. However, examination of skin snips does not always show the parasites and positive blood tests do not necessarily indicate that you are still infected with O. volvulus. There are treatments, such as ivermectin, available to kill the larvae in your body and thus prevent the symptoms of the disease, such as skin rash and blindness. Promising treatments, such as doxycycline, to kill the adult worms are currently being studied. You should discuss your treatment options with your health care provider. How can I prevent onchocerciasis? Blackflies bite during the day. The best prevention is avoiding being bitten by infected blackflies by using insecticides that contain N,N-Diethyl-meta-toluamide (DEET) on exposed skin, wearing long sleeve shirts and pants, and wearing permethrin treated clothing. Can I take medication to prevent onchocerciasis? No, there is neither a vaccine nor recommended drug available to prevent onchocerciasis.